Double winners University College Cork dominated both selections on Electric Ireland Higher Education GAA’s Rising Stars end-of-year teams. The Fitzgibbon Cup champions had eight representatives on the hurling team while the Sigerscon Cup winners had six on the football selection. 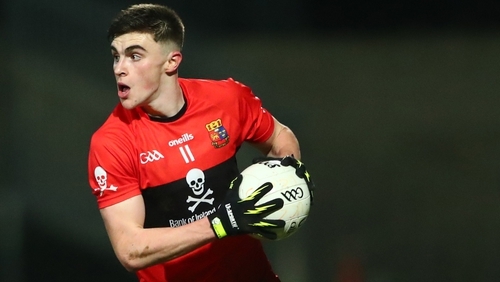 Despite UCC’s dominance there are five colleges represented on each panel with established inter-county senior players such as Aaron Gillane and Sean O’Shea shining alongside up-and-comers James Bergin and Jarlath Óg Burns. 2019 Rising Stars Football: Mark Reid (St Mary’s); Brian O Beaglaoích (UCC), Kevin McDonnell (NUIG), Graham O’Sullivan (UCC); Cian Kiely (UCC), Daniel O’Brien (UCC), Cillian O’Shea (UCD); Jarlath Óg Burns (St Mary’s), Padraig Lucey (UCC); Michael Langan (LYIT), Seán O’Shea (UCC), Peter Cooke (NUIG); Stephen McConville (St Mary’s), Evan O’Carroll (UCD), Shane McGuigan (St Mary’s). 2019 Rising Stars Hurling: Eoghan Cahill (Mary I); Niall O’Leary (UCC), Eddie Gunning (UCC), Thomas Grimes (Mary I); Chris O’Leary (UCC), Paddy O’Loughlin (UCC) Chris Crummy (DCU); Conor Browne (UCC), Jarlath Mannion (GMIT); Shane Kingson (UCC), Aaron Gillane (Mary I), James Bergin (DCU); Evan Niland (NUIG), Shane Conway (UCC), Mark Kehoe (UCC).